Tuesday July 20th 1920 A warm day. The folks busy with ironing and other work. I crotcheted some. Letter from Lorie says Fannie is getting along all right. Evening on the porch. Wednesday July 21st 1920 A warm day spent as yesterday was. I wrote Lizzie Lindley and took that mail for Lydia to the depot. 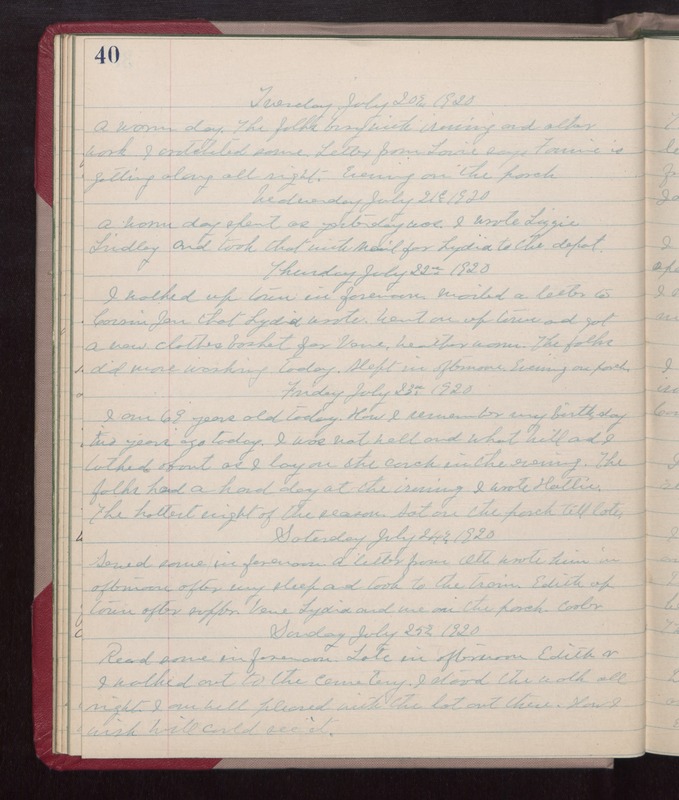 Thursday July 22nd 1920 I walked up town in forenoon. Mailed a letter to Cousin Jen that Lydia wrote. Went on up town and got a new clothes basket for Vene. weather warm. The folks did more washing today. Slept in afternoon. Evening on porch. Friday July 23rd 1920 I am 63 years old today. How I remember my birthday two years ago today. I was not well and what Will and I talked about as I lay on the couch in the evening. The folks had a hard day at the ironing. I wrote Hattie. The hottest night of the season. Sat on the porch till late. Saturday July 24th 1920 Sewed some in forenoon. A letter from Ott. Wrote him in afternoon after my sleep and took to the train. Edith up town after supper. Vene, Lydia, and me on the porch. cooler. Sunday July 25th 1920 Read some in forenoon. Late in afternoon Edith & I walked out to the cemetery. I stood the walk all right. I am well pleased with the lot out there. How I wish Will could see it.